THE VOYAGES AND ADVENTURES OF M/Y INCOGNITO! : Lots of great fishing! 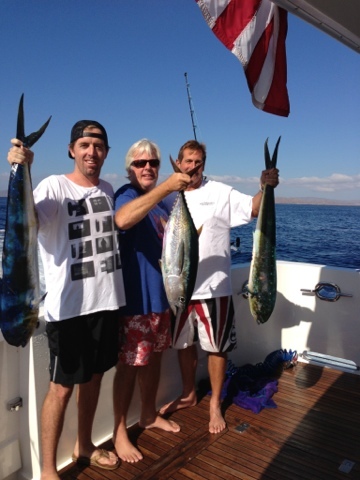 The three amigos with their Dorado's (Mahi Mahi) & a Yellowtail! Who knew Matt was quite the sushi chef?! 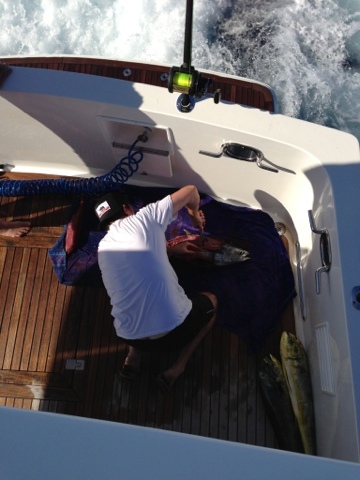 The boys filled up the freezer on the boat & dined on their catch as well. When they had their fill, they just did catch & release. Fun! Good looking fish! Do your hands now smell like fish instead of @*%#? Hee, hee!